BURLINGTON, VT--(Marketwired - April 25, 2017) - Tomato growing is the most popular gardening activity in the country. So can we do it any smarter? We asked gardening expert Craig Lehoullier, who literally wrote the book on tomatoes. LeHoullier (pronounced leh-HOO-lee-er) is author of Epic Tomatoes: How to Select and Grow the Best Varieties of All Time. Here are his top two tomato tips. Mulch -- because it cuts down on watering chores (as do self-watering containers, he adds.) Mulching also prevents the soil from splashing on the plant's lower foliage, and wet foliage is a magnet for fungal spores. Use Appropriate Spacing -- for good air flow and sun exposure. "Gardeners are so ambitious and excitable that we never give anything enough space," admits LeHoullier, who includes himself in that group. "It's all about healthy plants." LeHoullier specializes in growing tomatoes in containers. "Personally, we found that the sun shines best on our driveway and that's where our garden now is! I think last year we had 200 containers or so." Among his containers this year is the Gardener's Revolution® Classic Tomato Planter, from Gardener's Supply Company. 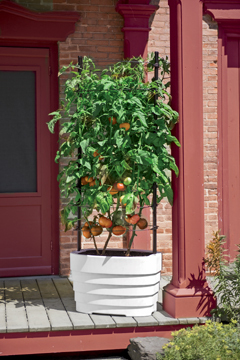 Breakthrough technology makes this self-watering planter the most effective way to grow tomatoes on your patio or deck. Sidewall ventilation and a lightweight Grow Bag liner "air-prune" roots, ensuring a dense, vigorous root system -- the secret to super-productive plants. And the Dual-Hydrate Watering system (with five gallon reservoir) ensures consistent moisture and reduces watering chores. Container gardening is a solution for a growing number of gardeners, says LeHoulllier: "Many people don't have a perfect plot of land on the side of their house where the sun always shines. Plenty of gardeners don't have a house or yard, just a balcony. Some are at an age where digging in the garden is just not in the cards for them anymore. So container gardening helps solve those problems." Whether you use an advanced, self-watering container or garden in the ground, LeHoullier thinks gardening is good for the soul: "That return to the earth is very therapeutic for most people, I think." Craig is a gardener, author, blogger and educator. He has recently written Growing Vegetables in Straw Bales: Easy Planting, Less Weeding, Early Harvests, and Epic Tomatoes: How to Select and Grow the Best Varieties of All Time. Craig has grown more than 3,000 types of tomatoes in the past 35 years and had 200 types in his driveway last year alone. Aside from growing his flavor favorites, this year's focus will be continuing the work of breeding great new tomatoes for container gardeners. Container gardening offers several big advantages.